I soooo lucked in to nabbing this on Sephora. I did a refresh, and there it was, so I instantly purchased it. I checked back once I received the in-stock notification e-mail, and sure enough, it was gone already. For a palette that is permanent, this sucker sure is hard to come by. Now on to the details. This palette is a steal at $44 for 12 nearly full-size eye shadows, plus a double-ended liner, PLUS a mini Primer Potion (not pictured). It is freaking huuuuge!! See how big it is compared to my Sephora Beauty Insiders Card (it's the same size as a standard credit card). 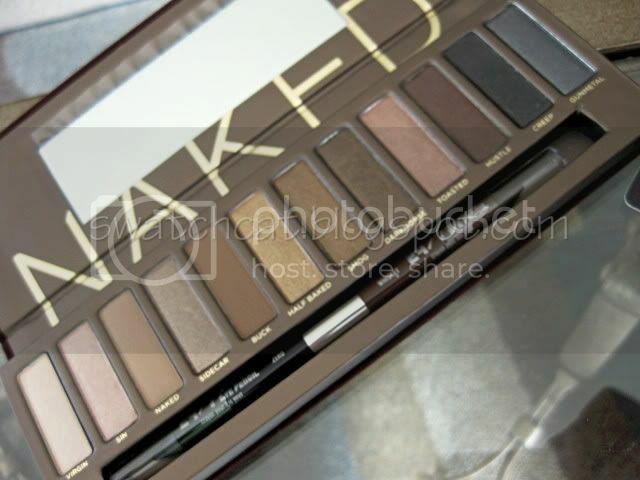 Never before has an Urban Decay palette been so appealing to me. Most of their palettes have teeny-tiny shadows in über-bright colors. I love my brights, but I already have enough to start my own clown-army. Neutrals are one color-category I never tire of. 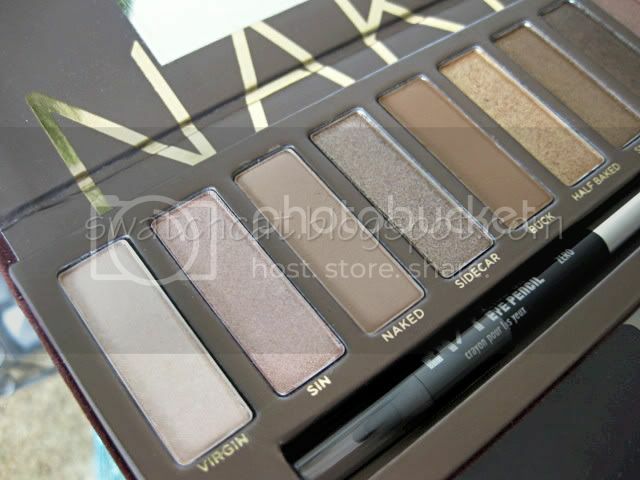 The shadows are housed in a slim, brown velvet case emblazoned with "NAKED" on the front. It's so...seductive, at least as much as an eye shadow palette can be. 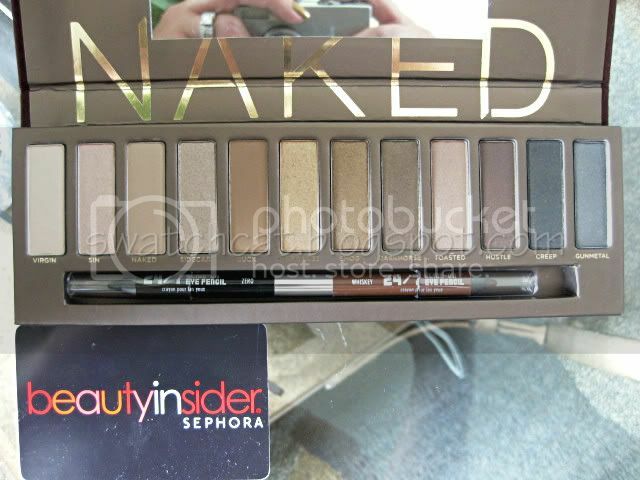 Although anything that screams "NAKED" is hardly a wallflower, and demands instant attention, including this palette. 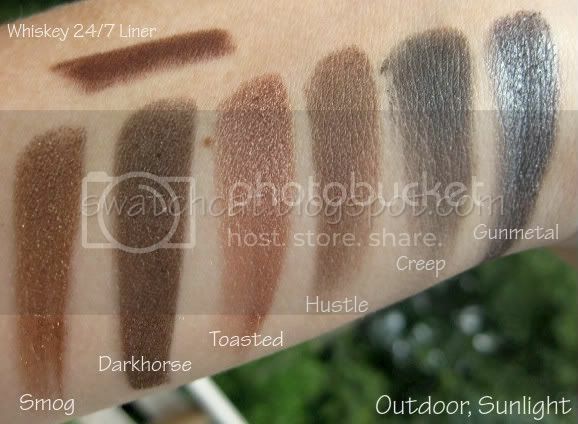 More of my incessant natter, pictures and swatches after the jump! For me to purchase a pre-made palette, it has to be special. I can barely bring myself to purchase a pre-made quad, let alone a compilation of epic proportions (OK...I may be exaggerating a bit on that last part, but you get the picture). This is my very FIRST palette. 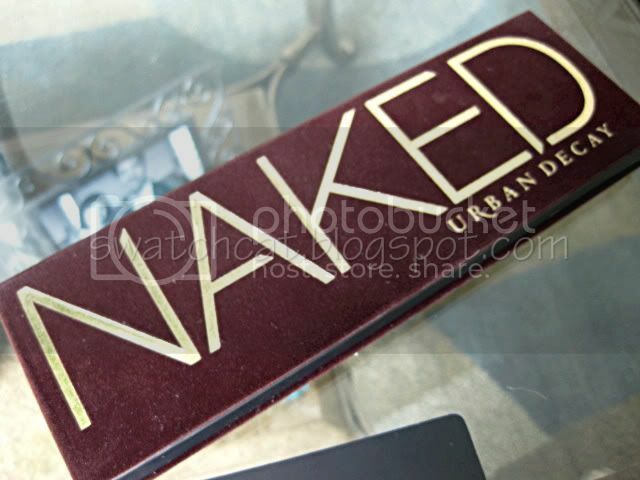 One of the reasons I was driven to purchase is that Urban Decay does do quality eye shadows. Yes, there are glitterbombs (hello, Midnight Cowboy, I'm talkin' to you), but there are so many others that are smooth and richly pigmented. While half the shadows are part of UD's permanent line, the other half are colors exclusive to this palette (it says only four are exclusive, so a couple must've been featured in other palettes, because they're not part of the permanent line...I checked). Furthermore, you'd pay in the neighborhood of $200 to acquire 12 shadows singly, leaving out the two liners and the Primer Potion. So, I say again, dear readers, this palette is a steal. Eye shadows featured are: Virgin (an ivory satin), Sin (a shimmery champagne), Naked (a matte taupe), Sidecar (a shimmering taupe), Buck (a matte cocoa), Half Baked (a shimmering gold), Smog (a shimmering bronze), Darkhorse (an olive-tinted, satiny dark chocolate), Toasted (a shimmering light copper), Hustle (a deep, satiny brownish plum), Creep (a matte charcoal with silver sparkles), and Gunmetal (a shimmering deep, silvery grey). 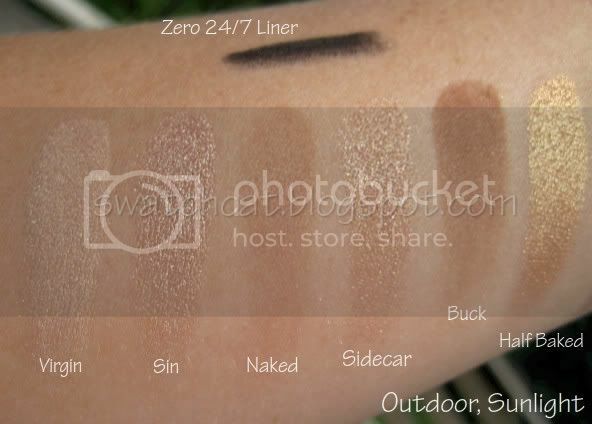 The double-ended 24/7 liner features Zero (a carbon black) and Whiskey (a warm, deep brown). 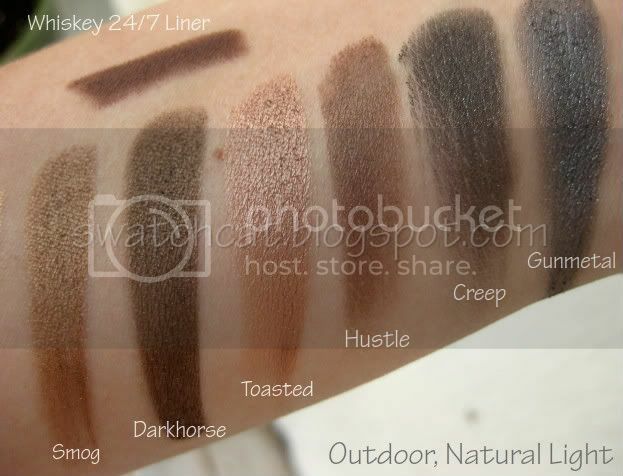 These shadows are so super silky smooth and pigmented. 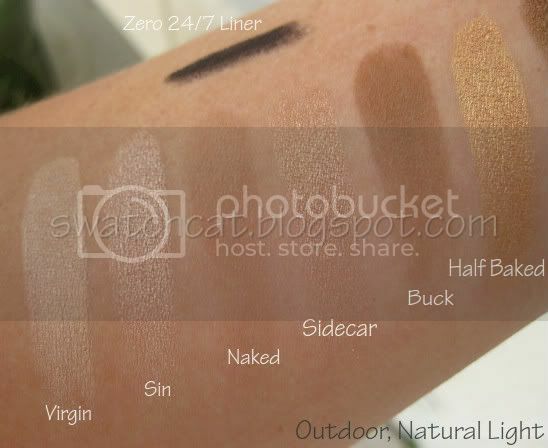 Each of the swatches is just one quick swipe and without a base! Now if I, and countless other bloggers who have featured this palette have convinced you that you NEED this palette (you do), please don't rush to e-Bay and pay those ridiculous prices. It is permanent, it is being restocked online, and it is cropping up at the brick-and-mortar locations. 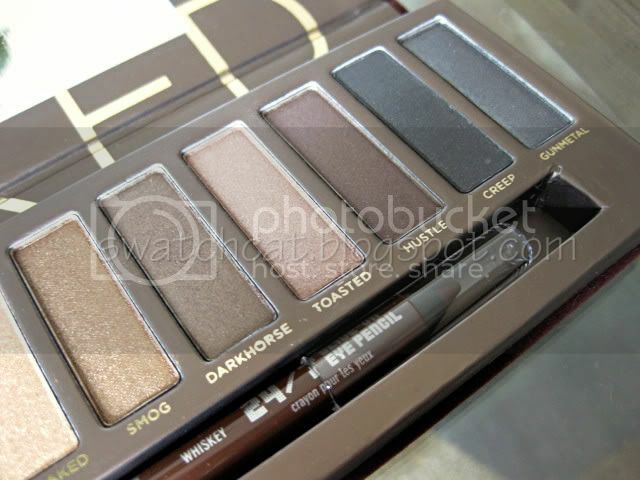 I will most certainly be posting a look or two featuring this palette, so stay tuned, readers! This palette gets and enthusiastic five paws up for versatility, quality and value! Waaah, why can't I find this anywhere? So jealous. I can't wait to get my hands on this! Sephora needs to step up their game. I don't wanna buy it from UD cause I want my insider points LOL. so glad you got your naked palette!